REUTERS, April 18: A Thai animal rescue group welcomed a dog who was rescued nearly 220 kilometers (136 miles) from shore Monday. 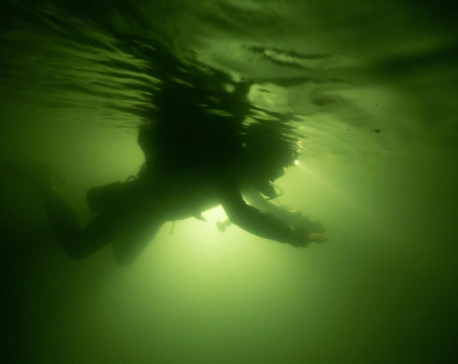 Three divers who helped rescue a Thai football team last year have made a fresh discovery in Vietnam where they explored a tunnel that could expand the footprint of the world's largest cave. BANGKOK, April 6: Thailand began elaborate rituals on Saturday leading to the coronation of King Maha Vajiralongkorn, who will be officially crowned in ceremonies from May 4 to 6. 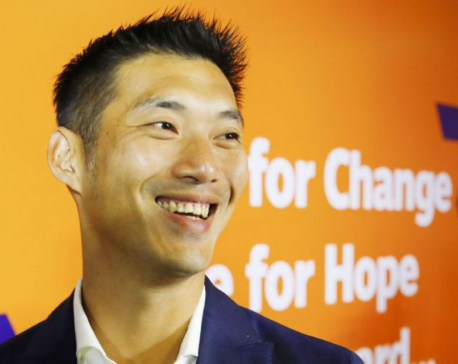 BANGKOK, April 6: The leader of a new party that has challenged Thailand’s military government was charged on Saturday with sedition, the latest legal action facing the rising star after a disputed March election. 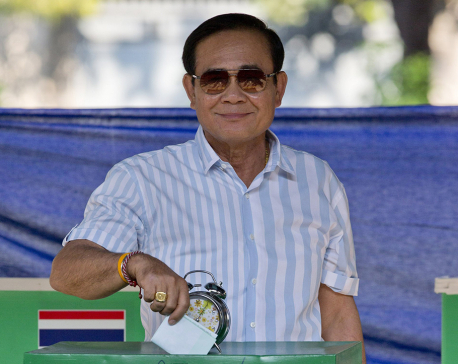 BANGKOK, March 24: A military-backed party has taken the lead in Thailand’s first election since a 2014 coup, preliminary results showed Sunday, suggesting junta leader and Prime Minister Prayuth Chan-ocha could stay in power. 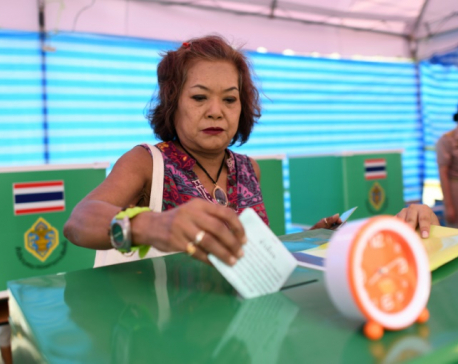 Polls opened Sunday for the first Thai election since a 2014 coup, with a high turnout expected among a public who received a cryptic last-minute warning from the Thai king to support "good" leaders to prevent "chaos." KATHMANDU, March 15: Chiang Mai, a city in northern Thailand, has been finalized as the venue for Asian Cricket Council (ACC) U-16 Eastern Region. 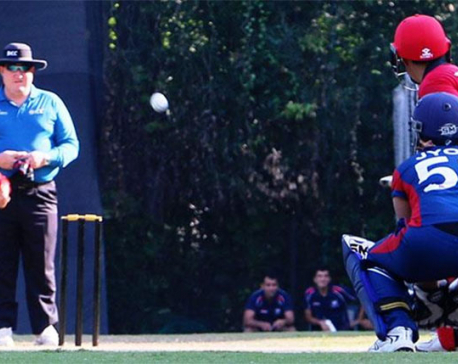 Defending champion Nepal will start its campaign to retain the trophy against Myanmar on April 20 at the Prem Tinsulanonda School cricket ground. 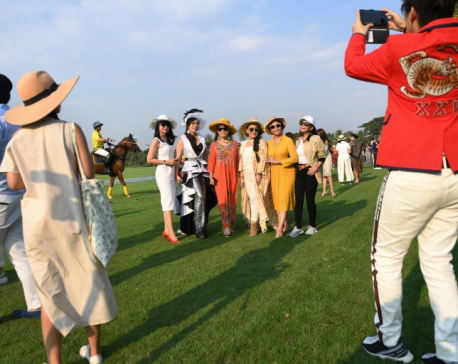 BANGKOK, March 14: It's polo season in Thailand and teams of jodhpur-clad Argentines and monied Asians gallop onto the flawless field, as spectators spill from a pavilion -- glasses of champagne in hand -- for the final chukka. 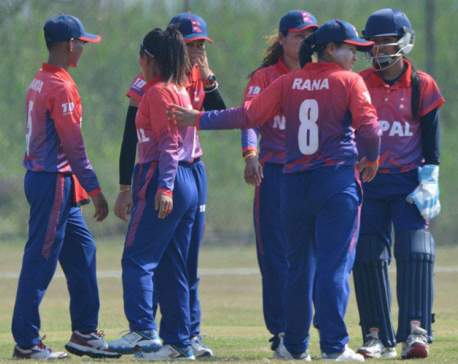 KATHMANDU, Feb 24: Nepal has defeated Hong Kong by four wickets at its fourth match under the ICC Women's T20 World Cup Asia Region Qualifier being held at Terdthai Cricket Ground, Bangkok on Sunday. 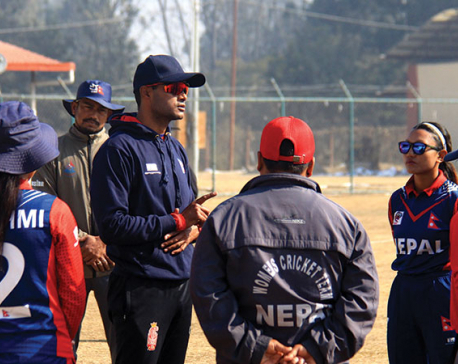 KATHMANDU, Feb 17: Nepal national women’s cricket team has left for Thailand on Saturday to take part in the ICC Women’s T20 World Cup Asian Region Qualifiers to start from Tuesday. 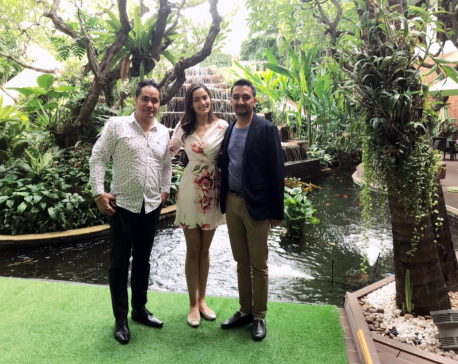 BANGKOK, Feb 15: As Pinit Ngarmpring, he was a CEO and sports promoter, well known in the world of Thai soccer. Now, under her preferred new name of Pauline Ngarmpring, she’s pursuing a bid to become the country’s first transgender prime minister. 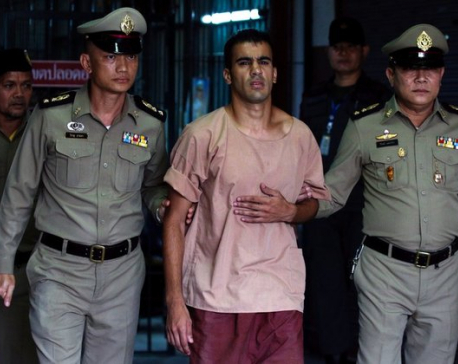 DUBAI, Feb 11: Bahrain said it has taken note of a “halt of legal proceedings” against refugee footballer Hakeem al-Araibi, who was released from a Thai jail on Monday after Bahraini authorities abandoned their bid to seek his extradition. 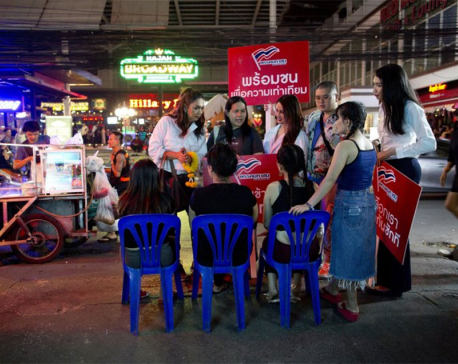 BANGKOK, Feb 8 : A Thai political party on Friday named a princess as its nominee to be the next prime minister, upending tradition that the royal palace plays no public role in politics and upsetting all predictions about what may happen in next month’s election. 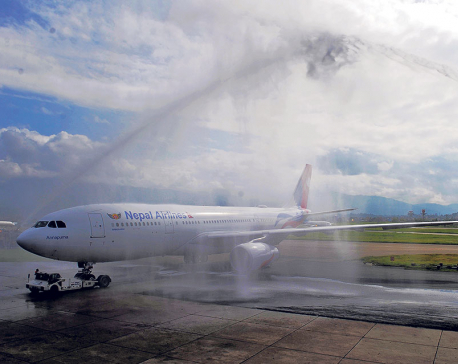 KATHMANDU, Jan 27: National flag carrier Nepal Airlines has announced a special offer on its flight to Bangkok of Thailand. 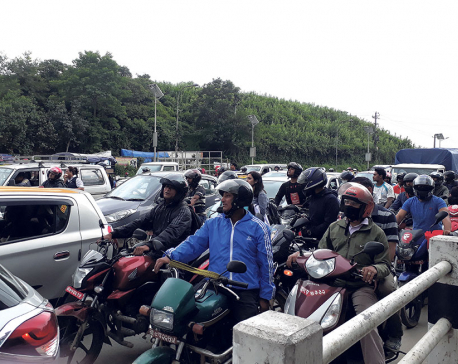 Under the scheme announced on Thursday, it will offer roundtrip ticket at Rs 12,000 on the Kathmandu-Bangkok sector, exclusive of applicable taxes. 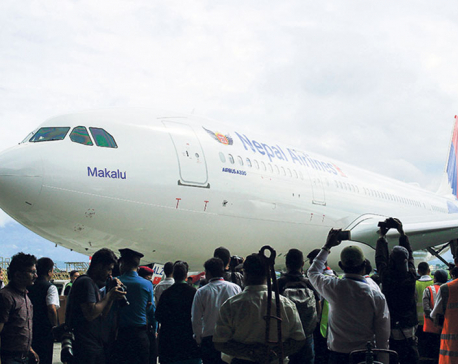 KATHMANDU, Jan 26: Nepal Airlines Corporation (NAC), the national flag- carrier, has come up with a promotional offer scheme in Kathmandu-Bangkok-Kathmandu route. KATHMANDU, Jan 22: Nepal and Oman are set to contest in the first game of the qualifying round for the Asian Football Confederation (AFC) U-23 Football Championship to be held in Thailand in 2020. KATHMANDU, Jan 19: Nepal Women’s National Cricket team has faced a 70-run defeat at the hand of host Thailand in the final match of Women’s Twenty20 Smash Cricket held at Bangkok, Thailand on Saturday. 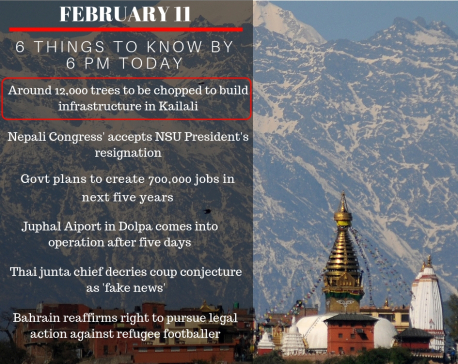 KATHMANDU, Jan 17: The Parliamentary Hearing Committee (PHC) is conducting the hearing for proposed ambassadors Deepak Adhikari to France and Ganesh Prasad Dhakal to Thailand today. KATHMANDU, Jan 16: Nepal has entered semi-finals as a group leader after registering fourth straight win in the ongoing Women T20 Smash Cricket Tournament underway in Thailand. KATHMANDU, Jan 14: Nepal has entered semi-finals by defeating United Arab Emirates (UAE) by six wickets at the Women T20 Smash Cricket Tournament underway in Thailand on Monday. KATHMANDU, Jan 12: Nepal registered its victory in the opening match of the Women T20 Smash Cricket Tournament in Thailand. It defeated China by 10 wickets, meeting the target of 49 runs posted by the rival in 8.4 balls. Nepal played without losing any wicket. 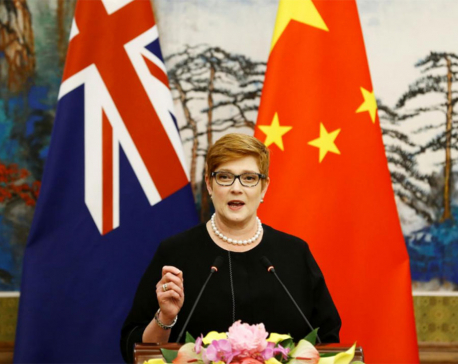 BANGKOK, Jan 10: Australian Foreign Minister Marise Payne was in Bangkok on Thursday after Canberra said it would consider giving asylum to an 18-year-old Saudi woman who fled to Thailand, saying she feared her family, which she accused of abuse, would kill her. KATHMANDU, Jan 10: A 14-member Nepal national women’s cricket squad has been announced to take part in Women’s T20 Smash being hosted in Thailand from January 12 to 18. 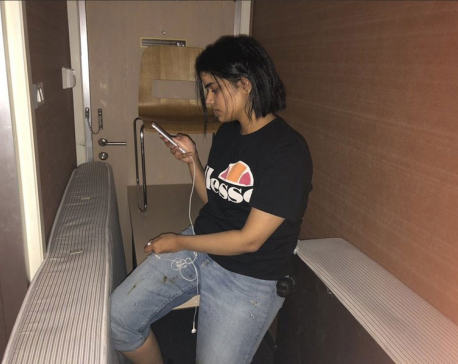 BANGKOK, Jan 7: A Saudi woman who says she is fleeing abuse by her family and wants asylum in Australia barricaded herself in an airport hotel in the Thai capital on Monday and was sending out desperate pleas for help over social media. 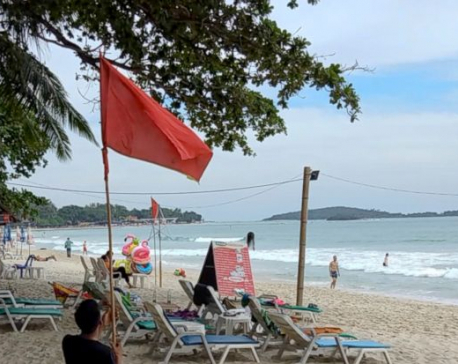 THAILAND, Jan 4: Thai authorities have suspended ferry services and evacuated locals and tourists ahead of a tropical storm expected to pound the country's southern beach resorts during peak tourism season. 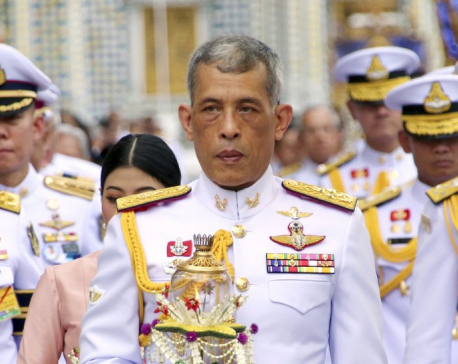 BANGKOK, Jan 1: Thailand’s King Maha Vajiralongkorn will have his official coronation on May 4, the palace announced Tuesday. KATHMANDU, Dec 26: The Non-Resident Nepali Association, Thailand honored Mahesh Maharjan, the gold medalist at the 10th World Bodybuilding and Physique Sports Champions held in Chiang Mai, Thailand organizing a congratulating event in Bangkok on 23rd December 2018. 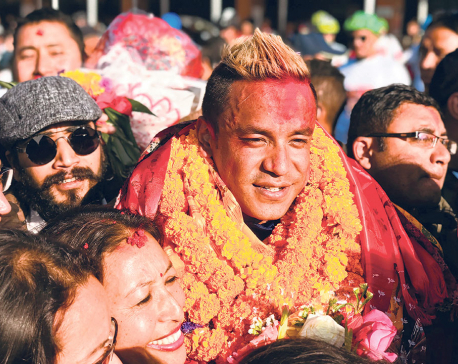 KATHMANDU, Dec 26: Hard work, determination, and patience -- the undeniable keys to success -- were in full display when Nepali player Maheshwor Maharjan won the gold in the 10th World Body Building and Sports Championship held in Chiang Mai, Thailand. 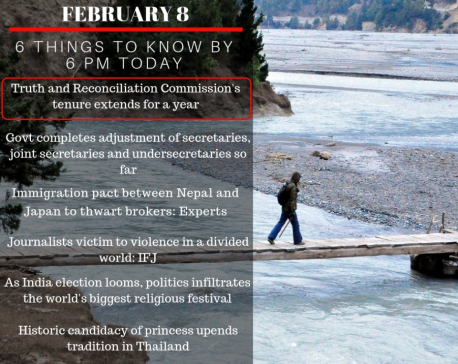 SURKHET, Dec 14: Recently, five elected local representatives of three local units in Surkhet district made a 15-day visit to Thailand, at the invitation of a non-governmental organization, TAO Association. They are now preparing to claim the travel expenses from their respective local units. KATHMANDU, Nov 16: Nepal national women’s cricket team is set to participate in the Woman T20 Smash organized by the Cricket Association of Thailand (CAT) from 11 to 19 January in Thailand. 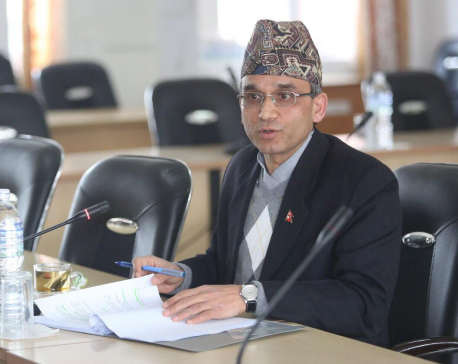 KATHMANDU, Nov 11: The federal government; and the province 1 council of ministers were apprised of the personal trip of province Chief Minister's Sherdhan Rai to Thailand and the United States of America, said Hikmat Karki, province minister for internal affairs and law. KATHMANDU, Nov 3: Thailand has become the first country to sign bilateral air services agreement with Nepal to operate commercial flights to Gautam Buddha International Airport (GBIA), located at Bhairahawa. BIRATNAGAR, Nov 2: Chief Minister of Province 1 Sherdhan Rai on Friday left for Thailand for his medical treatment. CM Rai will be treated for a throat problem at Bangkok-based Bumrungrad International Hospital, said Rai's press advisor Dhurba Subedi. 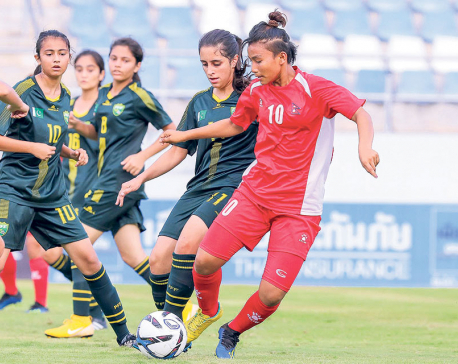 KATHMANDU, Oct 29: Nepal U-19 women’s team has registered a whopping 9-0 win over Pakistan in the last group match of the AFC U-19 Women’s Championship Qualification in Thailand on Sunday. 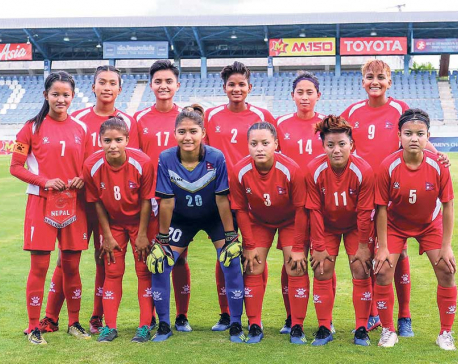 KATHMANDU, Oct 27: Nepal U-19 Women’s Team, which was in a do-or-die situation, has defeated India 2-0 to keep its hopes alive for the second round of the 2019 AFC U-19 Women’s Championship Qualifications in Thailand, Friday. 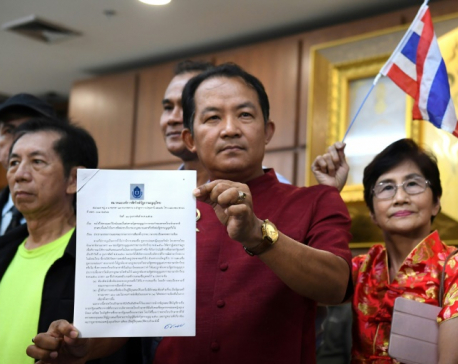 Thailand’s new army chief on Wednesday did not rule out another military intervention if there was political conflict after the return of civilian rule in a general election next year. 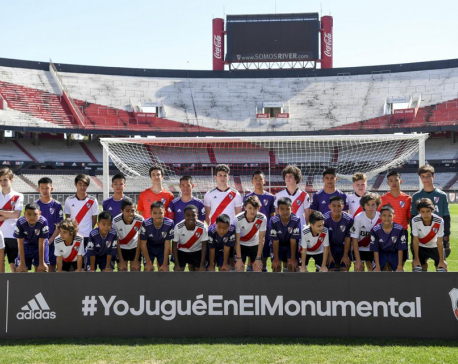 BUENOS AIRES, Oct 8: Twelve Thai boys and their football coach, who were dramatically rescued from a flooded cave in July, enjoyed a high-profile kickabout on Sunday, playing a game at River Plate’s iconic Monumental stadium. KATHMANDU, Oct 7: Nepal won by 140 runs as per D/L method against Thailand in the ICC World Twenty20 Asia Region Qualifier B at Kuala Lumpur. Seven traditional dancers from Bhaktapur traveled to Thailand on Monday to participate in a program hosted by Embassy of Nepal -- Bangkok, Thailand, to mark Thailand’s National Day on Wednesday. KATHMANDU, Sept 3: The summit meeting of Bay of Bengal Initiative for Multi-Sectoral Technical and Economic Cooperation (BIMSTEC) ended a few days back. 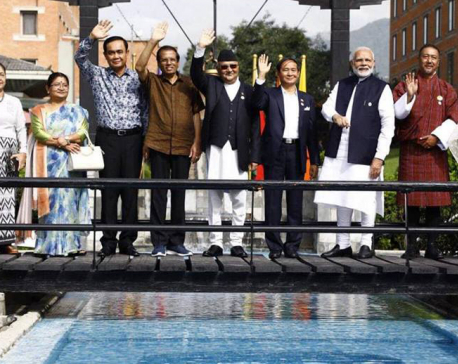 The summit saw a participation of heads of state or government of its seven-member nations -- Bangladesh, Bhutan, India, Myanmar, Nepal, Sri Lanka and Thailand. 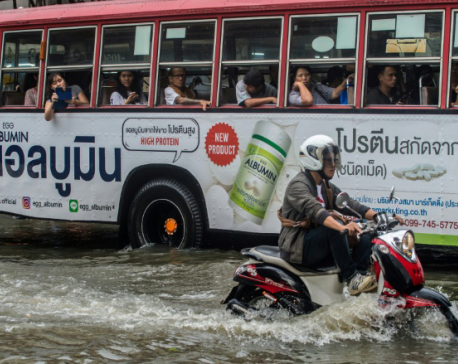 BANGKOK, Sept 2: As Bangkok prepares to host climate-change talks, the sprawling city of more than 10 million is itself under siege from the environment, with dire forecasts warning it could be partially submerged in just over a decade. KATHMANDU, Aug 31: Thailand's prime minister, Gen. Prayut Chan-o- cha (Ret.) has provided medicines and medical equipment worth US$ 1.5 million to his Nepali counterpart, KP Sharma Oli. BANGKOK, Aug 20: Thailand’s 86-year-old Queen Mother Sirikit is being treated for influenza at a Bangkok hospital, the Royal Household Bureau said in a statement on Monday in a rare statement on her health. 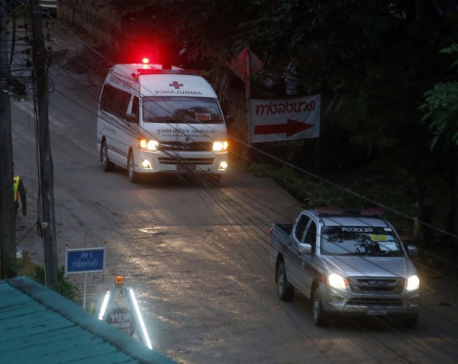 MAE SAI, July 8: Rescuers in northern Thailand on Sunday extracted four members of a youth soccer team from the cave where they had been trapped for more than two weeks, part of an ongoing operation to rescue the 12 boys and their coach. 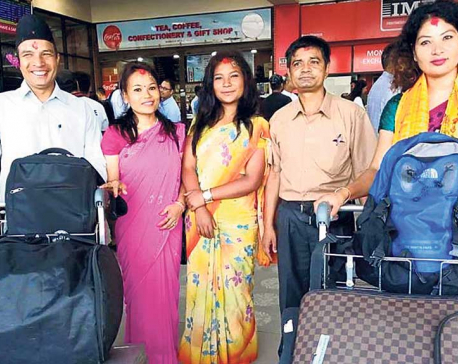 KATHMANDU, May 20: Minister for Industry, Commerce and Supplies, Matrika Prasad Yadav is leaving for Thailand at 1:30 PM for further treatment after recommendations from Nepali doctors. KATHMANDU, Dec 11: Nepal opened ACC U-16 Eastern Region Cricket Tournament with a 133-run win over home team Thailand on Monday. KATHMANDU, Nov 21: Nepal and Thailand shared a point each in their ICC Women’s World Twenty20 Qualifying Series Asia Region match on Monday.